BANDIT is an adorable 2 to 3 year old AST mix male who is sure to steal your heart. 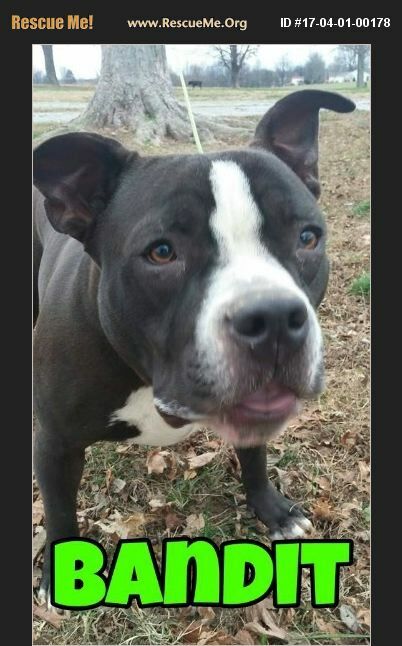 He was picked up as a stray by Animal Control in Union City, NW TN. He was not clamed by an owner and so he was rescued in order to save his life. He is one of several at a good foster home, but would love a home and family of his own. He is on the shorter, stouter side. He was recently diagnosed with a thyroid problem and will need to remain on medication for that. Because of his thyroid issue, he gained weight and currently weighs 83 pounds. He is now on a diet and thyroid medication and so weight loss is expected. He has some ligament damage in one knee which should be helped by weight loss but he may go on to have stiffness and arthritis in that knee. He is heartworm negative. He is current on vaccinations, microchipped, and neutered. Bandit is energetic but, with strong leadership, he will obey. He does jump when excited so, for that reason, he would do best in a home without toddlers since he would possibly knock them over. He has done well with the children aged 8 and above at his foster home. Bandit is a very sweet boy and listens very well when handled with a firm but loving approach. If you live in another state, don't let that stand in your way. We will work to transport Bandit if it means he will have a good forever home. If you are another rescue group, we will waive the adoption fee but you can make a donation toward vetting at your discretion. The adoption fee will help our 501(c)3 non-profit rescue to cover at least part of the cost of the veterinary care he has received.